For all the folks, who are preaparing for any competitive exams like Civil services, banking, govt. jobs, UPSC, NET or other competitive exams in which you require good General knowledge, then we have a deal for you. You can Buythe awesome book named Manorama Yearbook 2015 for just 140 Rs in this Amazon deal, which will normally cost you 250 Rs, but now you are saving here 110 Rs to your pocket. All india coupons always suggest the best deals and offers, so we already checked the reviews too, and they are awesome. it is the gem for knowledge seekers. 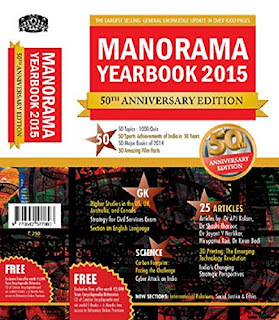 Manorama Yearbook 2015 for just 140 Rs. 140 Rs is the lowest available online price for Manorama Yearbook 2015. Hope you will get the success with this Excellent Competitive exam preparation book. Have a good day. Stay connected with All india coupons for more Discount offers and Freebies.